Less than a year after launching in the United States, Ofo now says it is laying off staff across the country and pulling out of several cities. 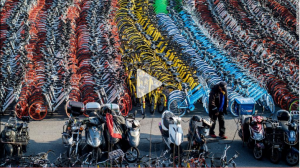 “As we continue to bring bikeshare to communities across the globe, Ofo has begun to reevaluate markets that present obstacles,” Andrew Daley, head of Ofo North America, said in a statement Thursday. The company will instead “prioritize growth in viable markets,” he added. Ofo employed about 120 people in the United States, and was operating in more than 30 American cities. The company said it will maintain operations in places like San Diego and Seattle, where it faces fewer regulatory challenges. An Ofo spokesman declined to say how many people would be laid off and which cities the company will abandon. It had already pulled out of Chicago earlier this month, citing regulatory hurdles. The Chinese startup is also facing competition from US ride-hailing giant Uber, which bought a dockless electric bike-sharing firm, Jump Bikes, in April.